Synergy’s CSR Snapshot features some of the most recent corporate social responsibility activities we’ve undertaken to make a positive impact in our communities. 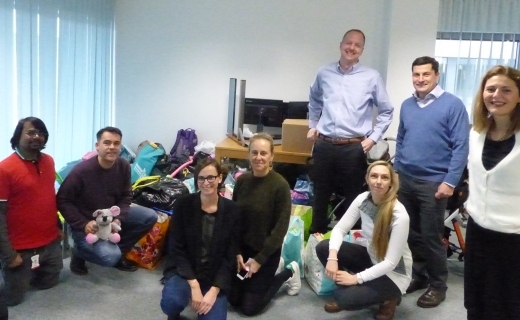 From late October to early December, our Luxembourg office held a toy drive to collect items for children of refugees in Luxembourg, and on Dec. 7 we donated about 30 bags of toys and childcare items to these children through the Luxembourg Red Cross. Some of our team members with all the items we donated. The Luxembourg Red Cross, which was founded in 1914 and today is served by a staff of approximately 1,900 employees and over 15,000 volunteers. As an official chapter of the international Red Cross, the Luxembourg Red Cross shares the global organization’s mission of preventing and alleviating human suffering in the face of emergencies by mobilizing the power of volunteers and the generosity of donors. As part of its wide range of services, the Luxembourg Red Cross offers specific assistance to refugees and migrants, providing shelter as well as educational, cultural, and leisure activities. Approximately 20 employees made donations. The visit was organized by our Employee Association, a group responsible for leading charitable and extracurricular activities in communities where Syniverse offices are located. Each year, many Syniverse Employee Associations around the world identify charitable organizations in their local areas, and then get the input of the office’s employees to select a few charities that the office would like to support. We held the toy drive for a month and a half, from late October to early December, and throughout this period continued to promote the drive and encourage employees to donate. 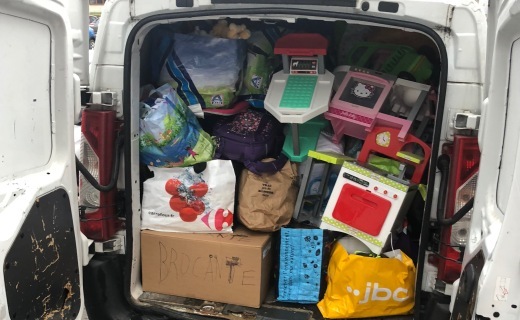 In the end, we succeeded in collecting about 30 bags of items that included a wide variety of toys, games, and books; winter clothes and shoes for children and adults; and childcare equipment. We delivered all the bags to the Luxembourg Red Cross on Dec. 7. All together, the donated items filled about 30 large bags! What was the most rewarding part of this activity? It was extremely rewarding to see how our colleagues responded to wanting to get involved in this charity project and realizing the difference we could make with a toy drive. Although we have about 90 people in our office, we weren’t sure how many donated items we would collect. 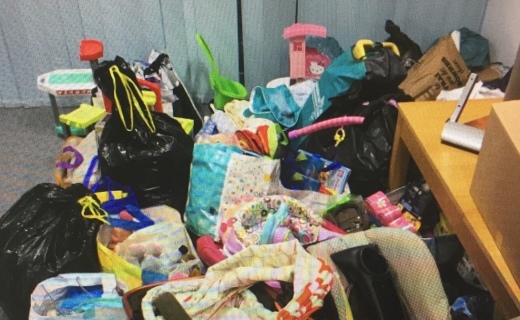 However, everyone got so involved with the effort, that we ended up accumulating 30 bags of toys and childcare items and needed to arrange for a large van to be able to accommodate and deliver all the donations! Physically seeing all these items at one time allowed me to visualize all the children and families that fled their home countries because of war, oppression or poverty, and how these toys and goods would help them. It was an image I’ll never forget, and an experience that I hope we can repeat again soon. Our van was barely big enough to transport everything! CSR Snapshot: Syniverse Makes Cross-Country Bike Ride for Charity in U.K.